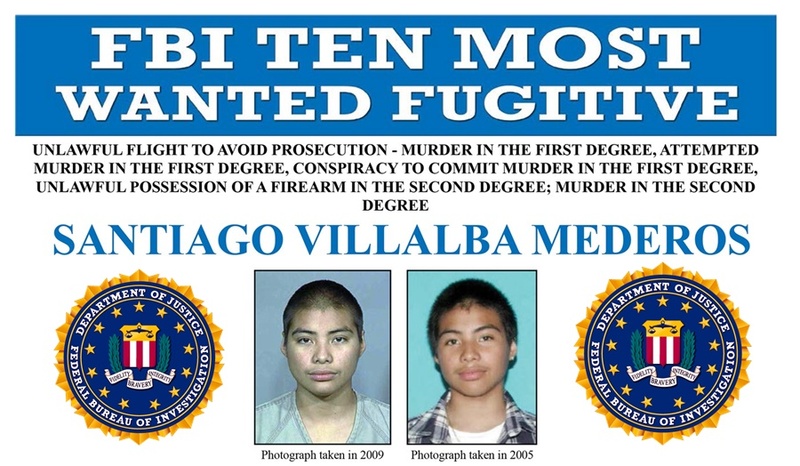 A Washington state gang member charged with two murders in 2010 has been named to the FBI’s Ten Most Wanted Fugitives list, and a reward of up to $100,000 is being offered for information leading to his capture. Santiago Villalba Mederos, a member of the violent Eastside Lokotes Sureno gang, is wanted in connection with two separate shootings in Tacoma, Washington, that resulted in the death of a young woman and the serious wounding of her brother, and a month later, the murder of a young man. Mederos was a teenager at the time of the killings. In February 2010, Mederos—who goes by the nickname “Pucho”—allegedly fired multiple shots into a random car, killing a 20-year-old woman and wounding her brother. The following month, during a robbery that turned into a fight when bystanders became involved, Mederos allegedly fired a single gunshot toward the group, striking and killing a 21-year-old innocent bystander. “In both the cases he’s wanted for, none of the victims had anything to do with gangs,” said Steve Reopelle, a homicide detective with the Tacoma Police Department who has investigated both murders. Based on witness reports, it is believed that Mederos—19 years old at the time—fled to Mexico after the murders. He may have returned to the U.S. since 2010, which is why investigators are looking for the public’s assistance in both countries. In addition to Washington state charges including first- and second-degree murder, Mederos has been charged federally with unlawful flight to avoid prosecution. Naming Mederos to the Ten Most Wanted Fugitives list means that the case will get much wider exposure and public attention, and the reward for his capture increases to as much as $100,000. The FBI and the Tacoma Police Department have been working closely together to bring Mederos to justice. “We believe he is still extremely dangerous and a threat to the community, wherever he is,” Postma said. Mederos, now 26 years old, speaks English and Spanish. He is known to have ties to the states of Guerrero and Morelos in Mexico. He also has ties to Washington state. He is approximately 5 feet 10 inches tall and weighs 140 pounds. He has black hair, brown eyes, and distinguishing tattoos: the letter “S” on his left shoulder and the letter “E” on his right shoulder. Anyone with information concerning Mederos should take no action themselves, but instead immediately contact the nearest FBI office or local law enforcement agency. For possible sightings outside the United States, contact the nearest U.S. Embassy or Consulate. The FBI’s Seattle Field Office can be reached at 206-622-0460. The U.S. Embassy in Mexico City can be reached at 011-52-55-5080-2000. Tips can also be submitted at 1-800-CALL FBI or online at tips.fbi.gov. *Note: All writing and pictures are a product directly from the Federal Bureau of Investigation, & The U.S. Justice Department.